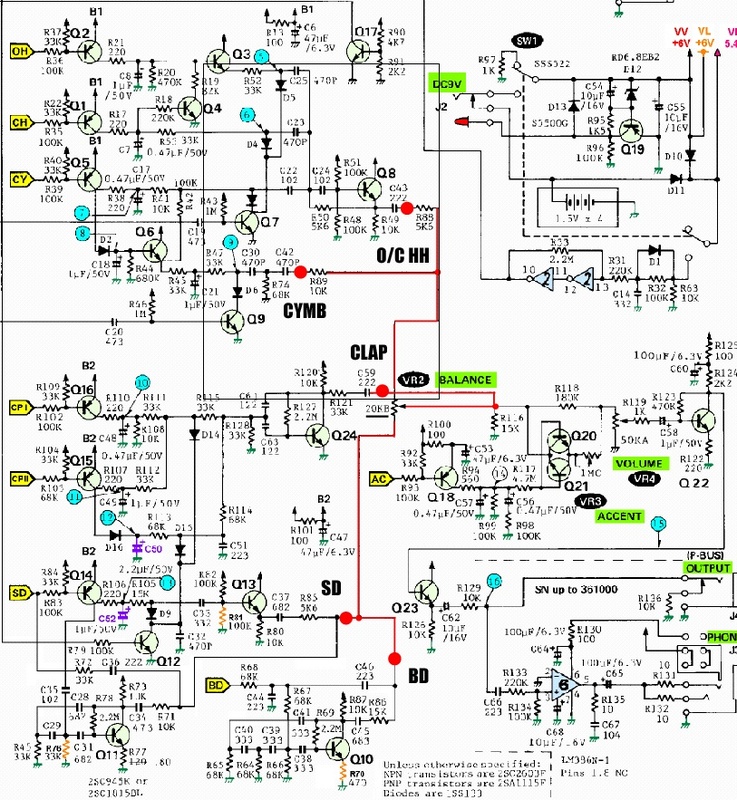 cool colour schematic from here. With snare loops, variation on the noise generator for the hi-hats and cymbals etc etc. Ugly patch box attached with tape. My first stab at a drum machine hack.. I can't find any circuit-bending page with mods...if anyone does. i`ve been working on the dr110 quite a lot. the red spots are indeed where you will connect indy outs, exept for the open hihat, closed hihat and the cymbal. their circuitry is so intertwined that it is not possible to separate them. for those, add a volume control after the juncture of R88 / R89. Yes, these outs work. I tried them on mine but couldn't fit the NC jacks with the other mods I'd done. Individual outs are waiting until I recase it. OK, this thread was a while ago but I try anyway. I'm interested in raising the volume of the Hand Clap. Looking at the schematis and considering what you're saying about the red dots I'm guessing I shoudl do something with the resistors R120/R121. Maybe lowering R121. Had a go at this myself, lowering R121 to about 15k (it was 30k) and this raised the volume of clap a bit (not so much) also the clap got a bit more treble. The effect was not very dramatic so there might be a better solution. I've also try to boost clap with no much success... but individual outputs is a must-have. Try decreasing R114 and R115 and/or increasing R128. Hi gang! I know it's been a while since I've posted anything worthwhile. For about the past year and a half I've been working on a number analog percussion circuits as a follow up to the TH Quad Bass++ project. While perusing ebay a number of months ago, I found a fairly cheap Boss DR110 in need of some TLC. Since I was only interested in the analog portion of the unit, I removed the analog pcb from the case and created a 2u rack panel. I've saved the case and digital portion for future experimentation. The end result is similar to a stripped down Roland 808. Now before you think that the DR110 is inferior to the 808 and it's older, bigger brothers, remember the DR110 was designed last, when the Roland engineers were more experienced and at the top of their game. The fully modded DR110 is every bit as good as the 808.....or any analog drum machine IMHO. The mods I used were a mix of those found at Resonant Frequency, Plutonique9/hyperreal.org and those of Dave Magnuson. I'm sure I messed that all up, so I apologize for missing anyone who deserves some credit here. Anyone who wants to chime in with credit for any of these is appreciated. A lot of these mods have been regurgitated a number of times on the internet and full credit might have been lost. See reference links below. As you can see, this adds a ton of wires to the unit. I probably spent more time dealing with broken wires to the pcb than the actual wire-up. Also, be very careful with pcb as it is not a very high quality board and traces are delicate. I did add 6 pushbutton triggers to the front panel. I find these convenient for troubleshooting on the bench and auditioning the voices without having to hook up the full midi rig. There are two other important things I did add to make this thing work with my studio midi set-up: input buffers for the triggers and a PICAXE chip to supply the 3 triggers to clap input 1 and the delay trigger to clap input 2. First the interface circuit: I used a 4050 CMOS hex buffer as the first stage. The 4050 will handle up to +15V of protection...more than I need. Since the bass drum will trigger off a positive or negative trigger, the output of that buffer can go directly to the DR110 bass trigger. I put a diode in series with the output to prevent double triggering when using the front button. Similarly, I programmed the PICAXE to operate on a positive trigger, so the output of that buffer goes directly to the PICAXE chip. The 10K pulldown to the PICAXE input is necessary to prevent extra triggering of the clap when other voices fire. For the snare, hats and cymbal, the buffer feeds a 4049 hex inverter to give the necessary negative logic triggers to those voices. The PICAXE idea arose about 18 months ago when Thomas Henry got me interested in that. I thought of a couple more elaborate ways to use a couple CMOS chips to simulate the multiple triggers that the DR110 clap requires, but the PICAXE was a one chip solution and the entire program and programming of the chip took well under an hour, so it was really a simple solution. The program I used is listed below. It's been many decades since I've done any Basic programming, so I'm sure it's not the best code that's ever been written. If anybody wants to make suggestions to improve this code, please do. I'm not proud. But I can testify that this code works just fine. Have to give partial credit to TH as I modified a similar program of his to create this one. A special thanks for this project goes to RichardC64 who's provided a large amount of knowledge, support, guidance, etc. 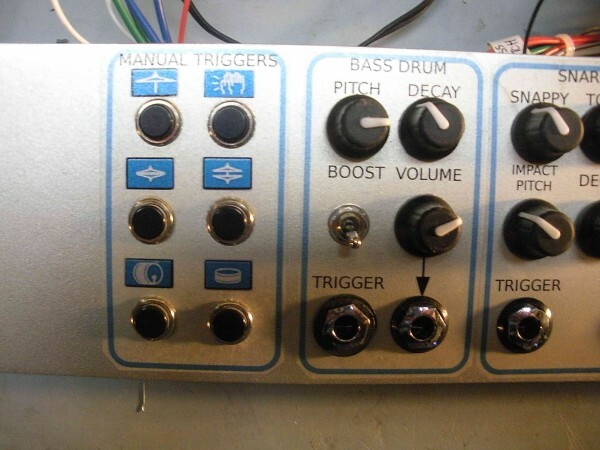 sample of the clap being triggered manually as I adjust the various controls. This is with the PICAXE providing the multiple triggers the DR110 clap sound requires to sound like more than one hand clapping (I sense a joke in here). 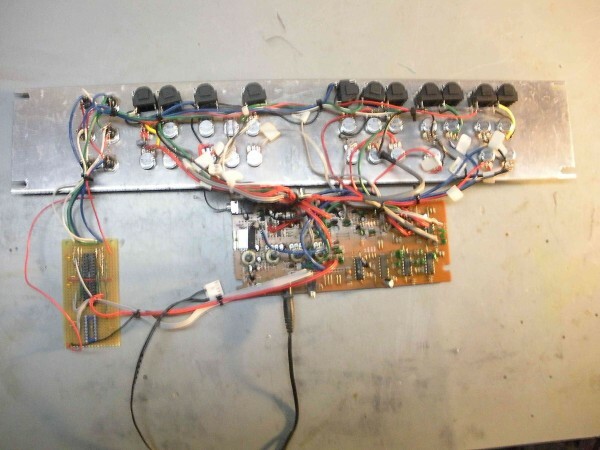 Sorry I forgot to post my interface circuit. RichardC64 pointed out to me that had I programmed the PIC for negative logic, I could've eliminated the 4050. When you told me what you were doing, I had no idea it would turn out like that! Very nice work, man. Wow, this is neat stuff! Dan, that is an awesome piece of work! I'm curious, how did you wire the individual outs? I used Funkyfarm's schematic above to find the audio out points. I did have to break a trace or two and remove resistors after those points so that the sounds weren't mixed together. I probably should have created buffers for each voice, but the signals are fairly strong and I'm using an op amp based mixer on the outputs. I did have to break a trace or two and remove resistors after those points so that the sounds weren't mixed together. I probably should have created buffers for each voice, but the signals are fairly strong and I'm using an op amp based mixer on the outputs. Sorry for the noobish questions... I'm still trying to get my head around this stuff. Is it unavoidable to break traces and remove resistors? Is there a way to mod the unit for individual outs and other fun things while retaining the original functionality? I mean can it be modded so that it will work normally without the breakout box attached? 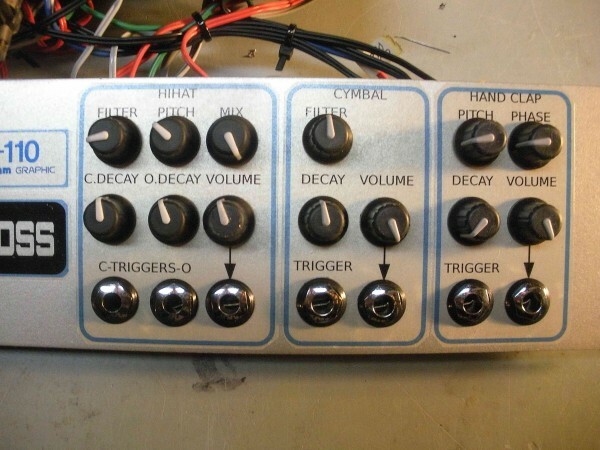 I also am curious about the op amp based mixer on the outputs. What does this achieve? Any chance you could post or PM even the most basic of schematics? I don't see how. Right now all the signals come together in the DR110 so if you had individuals outs, you'd still get bleed-thru by leaving resistors and traces in place. Also, if you don't add a breakout box or panel where exactly do you think you're going to mount all the jacks and controls? I suppose it's possible with teeny-weeny pots and jacks but the case will look like Frankenstein. These mods are not for the timid. You might be better off buying some of the individual drum voice pcbs others are offering and build up a kit from those. The mixer itself is not critical. I happen to use a couple of vintage PAIA op-amp based mixers, but any active mixer should work fine. The mixer then acts as the output buffers. I don't see how. Right now all the signals come together in the DR110 so if you had individuals outs, you'd still get bleed-thru by leaving resistors and traces in place. Where should the traces be cut, and what resistors should be removed? Also, if you don't add a breakout box or panel where exactly do you think you're going to mount all the jacks and controls? I suppose it's possible with teeny-weeny pots and jacks but the case will look like Frankenstein. I think I didn't phrase my original inquiry well. What I meant was, of course I know that the DR is a tiny little thing, with minimal (at best) room for any in-box mods, and that a breakout box is a given. I wondered if there was a way to mod the DR so that it would function normally if the breakout box was removed. I've seen a few instances of mods where the breakout box is connected to the DR by a multi-pin cable (looked like a serial cable or something, more than 20-pin kinda deal). I was basically just curious as to whether or not the DR functioned normally without the breakout box connected. These mods are not for the timid. You might be better off buying some of the individual drum voice pcbs others are offering and build up a kit from those. I'm not sure how to respond to the timid thing, other than raising one eyebrow like Spock. Anyway, the reason I'm interested in the DR, as opposed to the individual drum voice pcbs/kit deal is first and foremost because I really like the sound of the DR (especially the kick and snare)—like an 808, but different, and somehow better to my ears than a 606. However, I'd like a little more editing options, and sync options as well, thus the interest in the mods. break the trace between R85+R86/c46 junction and break the trace to VR2 to isolate the bass and snare voices. Use funkyfarm's red dots to attach wires for individual outs. I was basically just curious as to whether or not the DR functioned normally without the breakout box connected. I think it could be done but with a lot more monkey business. It would be more complex than what I've done. Actually, the bass and snare portion would be fairly easy to perfboard up...and a lot cheaper. The bass is particularly easy. In lieu of the Quad Bass++, it would be really easy to make a quad DR110 Bass. Dang! I wish I had thought of that before I approached Thomas Henry and State Machine to do the pcb! But back to your topic...if you do get a DR110, you may want to just leave the hats, cymbals, clap alone and do the snare/bass mods....those were very clean. Bringing out Bass and Snare would be a little more complicated. Bass is made up of a tone (C45 & R86,) and a click for Impact (C46). THREE signals comprise the Snare: tone, click and noise. Hi-Hat and Cymbal can only be partly separated, due to the filter formed by Q8 filters both the Hi-hat and the "ping" portion of the Cymbal sound. So maybe a less thorough separation might be more practical. Wait, what? I have a job now? I like Richard's solution better than mine for separate outs. I'd still want the SD and BD to be separate. He also brings up a good point about the cymbal. I'm living with them as separate as I have two other cymbal units to help fill those sounds out. yeah....analyzing these drum circuits and making snarky remarks! The DR arrived today so I'm eager to get started. I will probably leave the hats/cymbal grouped to one output, with the kick, snare and clap getting an individual out each. I have yet another question though. I have sorta made up my mind that I don't care if the DR doesn't function without the breakout box... so my question is this: is it ok just to follow the red dot spots (per the schematic posted by funkyfarm) for places to break the traces and run lines to individual outs? Do I need to place caps in line like on the little schematic by Richardc64? I will probably leave the hats/cymbal grouped to one output, with the kick, snare and clap getting an individual out each. ...I have sorta made up my mind that I don't care if the DR doesn't function without the breakout box... so my question is this: is it ok just to follow the red dot spots (per the schematic posted by funkyfarm) for places to break the traces and run lines to individual outs? Do I need to place caps in line like on the little schematic by Richardc64? In that case, no, you won't need to add any caps or resistors. Follow Dan's directions for separating SD, BD & Clap. (funkyfarm's red dots.) You then can tap the combined HH & CY at the "top" end of the Balance pot. You won't have to cut or desolder anything there if you always keep '110 Volume at zero. Edit: OR use the '110's volume & output as the HH & CY out. Hello again. I've managed to nearly finish my modded DR-110. Thanks for all the help and input, it's much appreciated. But what a fun little machine! SOme great mods on there. IVe got a 606 which i do love, but im going to have to get a 110 (or build bits of it). I built (with the help of richardc64) the Envelopes (modded) and VCA from the 110 for my liquid hihat, and it sounds amazing. TheOutsider has done a wicked job with his DR110 I think.. he's been really helpful to me with some info I was lacking. A lot of the sites have dead links so I'm hoping he will email me when he gets a chance about how he did his sync input mod.. Cheers for your help!